Logo Contest! Not just one, but TWO! So after several years of existence, TPF has decided to hold a contest. 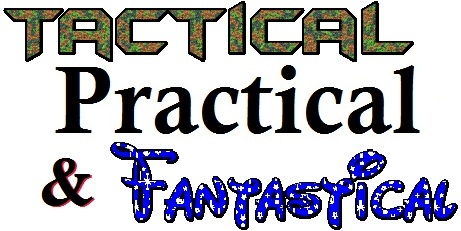 We need a logo that represents Tactical Practical & Fantastical. We are not talking an image or cartoon, but our name in a logo that sets it apart from others. We have had this old homemade logo which will give the approximation of what we are looking for. We want the visuals to be similar in nature with each word representing that aspect of the name. We would like versions to be linear as well as stacked like the example above. Looking for a much higher resolution and quality than the old Microsoft Word created one shown (yes MS Word 2007). Some associates of TPF have asked us to piggy back a second logo contest for them to be held concurrently. They have a good idea of what they want, but would like one that is more realistic in colour and appearance. Shading and such to give 3D effects would be great. SO the winners of the logo contests (YES there are 2) will receive a knife and/or multitool from TPF-Online and some other swag. If we have extra swag I’ll put in 2nd and 3rd place prizes for both logo contests. Submissions should be sent to info@tpf-online.com. Final resolutions should be 1000 pixels in either height or width minimum and 4000 maximum in any single direction. Please submit in JPEG, TIF, or GIF format. The end date for both contests is at midnight (EST) on June 4th. Bear Grylls Survival Kit – Is it really the ultimate? For many readers, the name Bear Grylls may sound somewhat familiar. If you watched a fair amount of outdoors featured television programs, you may have come across the show Man versus Wild. Man versus Wild ran from mid-2006 until late-2011 and starred Edward Michael “Bear” Grylls who demonstrated various survival techniques and theoretical situations and various methods of resolving those problems. Gerber Legendary Knives has collaborated with Bear Grylls in launching a survival series of products which are purportedly for aiding outdoorsmen during their foray’s into the wilderness. In today’s installment of TPF, The Ultimate Kit of the Gerber/Bear Grylls survival series is reviewed. According to Gerber and Bear Grylls, this small bag contains the essentials for an EDC emergency survival kit. The first thing you will note is the bag the kit comes in itself. manufactured from a lightweight black nylon material which has additional heavy reinforcement threads, a.k.a. Ripstop weaving, to help resist tearing and ripping, and prevent the expansion of small tears which may occur. The zipper closure is classed as being waterproof, but there is a very small gap in the teeth obvious when the zipper is fully closed, which visually seems to void this claim. The author did not however actually test the waterproof claim so it MAY be true. The two most identifiable and visible items that are seen is the lanyard whistle attached to the zipper and the Land-to-Air rescue instructions which are located on the backside of the bag. With All the various components still packed inside, the bag measures roughly 170mm x 120mm x 40mm (6.7″ x 5.5″ x 1.6″) and masses roughly 280 grams (9.0 oz). From the Gerber factory, all the components are contained inside a waterproof zip-loc transparent bag, which is manufactured from extra thick materials. The author was quite impressed with the sheer volume of items contained, but TPF will allow the readers to judge the individual components as being worthwhile for inclusion in the Ultimate Kit. TPF will go through the list of items contained in the Ultimate Kit for the Survivor Series line. Waterproof Ziplock Bag – The container that all inner tools come packaged inside. For this review, none of the items were removed from their packaging and approximations were made about lengths, but it is impressive to see just how much one is able fit into the small bag. There are some very nice and well thought out items in this package such as the cotton ball tinder and the brass snare wire, but at the same token, why is there so little of them? You could easily hold two to three times the quantity of snare wire, cotton balls, fishing line, etc.. without worrying about internal space constraints or cost extras. 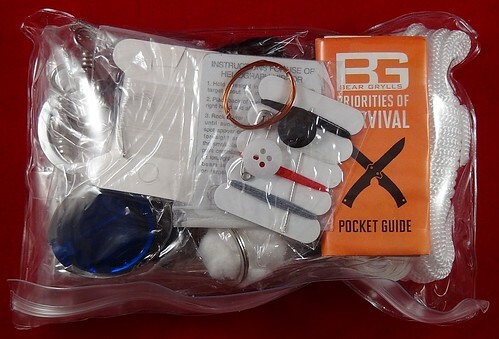 Readers should be aware that this kit is not intended to be a long-term survival kit, which would be much larger and include greater quantities of items as well as items such as a water purification system, first aid kits, etc… The Ultimate Kit is literally for a small EDC style carry for those who are not stereotypical “Survivalists” and in this it succeeds remarkably well. 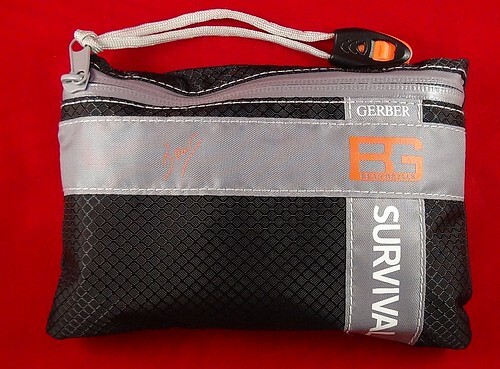 The Bear Grylls Survivor Series Ultimate Kit is offered by Gerber Gear at an MSRP of $52 USD, and can be found at numerous stores across Canada such as Cabela’s in Winnipeg, Manitoba. As always, it is up to the reader to have their own say on if the Ultimate kit as reviewed is Tactical, Practical, or Fantastical? An interesting take on an EDC multi-Tool. Is it all you truly need? Sometimes a product comes around that defies TPF’s standard conceptual understanding of what that product’s generic style should entail or encompass. It is a very rare event however. 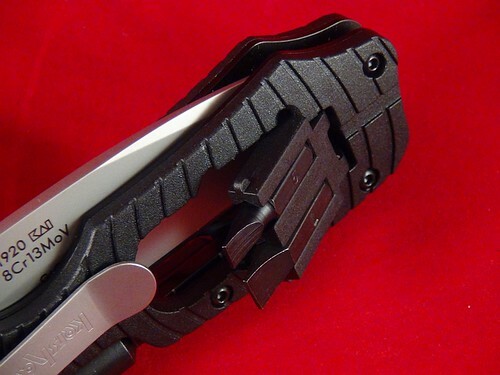 Yet Kershaw knives has done exactly that with their off beat multi-tool, the Select Fire. Kershaw Knives are not unknown to many readers, but there are a few who have never heard of this company. Kershaw Knives was founded in 1974 in Portland, Oregon when knife salesman Pete Kershaw started a cutlery company that would make knives from his designs. Those designs were manufactured by Japanese based KAI Cutlery. In 1978, KAI Cutlery purchased Kershaw Knives and the overall company was renamed KAI USA Ltd. KAI USA continues today with three product lines; including the original Kershaw Knives and Shun Cutlery which primarily markets kitchen cutlery. Fast forward to 1998, and after nearly 25 years of knife design and manufacturing, Mister Pete Kershaw, then company president, retired with a corporate legacy of good quality products for value and a superb customer service program, which continue to this day. Most common every day carry multi-tools are based primarily around a set of pliers with accessory tools and blades as secondary components of the tool. 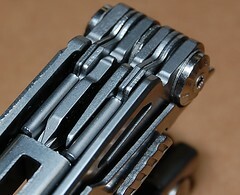 In this EDC product there are simply two tool arms with a couple additional features added in. If one was to ask what is comparable to this product, the first idea that popped into the author’s mind was an older, simple swiss-army tool. What makes it similar to that well-known and house-hold description? The first thing that is noticeable about the Kershaw Select Fire is that is first and foremost a folding knife with some additional tools added in for when they are required. This is where the difference in EDC multi-tool design philosophy is apparent. Is it more desirable to have a dedicated tool with a blade being secondary, or is a blade the primarily used part and other items are secondary. As stated, the Select Fire is designed around a 86.0mm (3-3/8″) spear-point profile blade. Manufactured from 8Cr13MoV steel and having a satin finish, the non-serrated blade incorporates both a slight hollow grind and re-curve edge in its design. Mounted in the 3.1mm (1/8″) wide spine are a pair of opposed thumb studs for ambidextrous opening. The blade itself is nestled between a set of steel liners, one of which has the liner locking mechanism for ensuring a securely extended position. The glass-filled nylon panels are moulded in black with a fish bone shaped pattern on them. Secured to the liners via a series of hex socket rounded head screws on each side, the panels are comfortable even when using the secondary tool arm of the Select Fire. The secondary tool in this design is an extendable 6.4mm (1/4″) hex bit driver which has three positions retained by a small spring-loaded bar. Available are the closed, 90° (half) and 180° (full) extended positions. Roughly 64.0mm (2-1/2″) in length, the bit driver turns the multi-tool into a true screwdriver with minimal profile changes to the main handle of the Select Fire. The author has not tested the durability of the driver arm, but the main shaft is rectangular in section 3.1mm x 4.8mm (1/8″ x 3/16″) and seems to be very sturdy. Like most bit drivers however, the usefulness is limited without the actual drive bits themselves. This is where the design of the Select Fire takes a turn to modern methods and ideas. Most multi-tools which have some sort of screwdriver tool arm have very short malformed driver heads and are very hard to manage as a useful screwdrivers. For those multi-tools that incorporate a bit driver attachment, the actual bits are sometimes miniaturized and/or proprietary and once lost are expensive to replace. The other multi-tools which use full-sized bits have an additional pouches, sleeves, or external holders to ensure that your bits are nearby when you want them. The Select Fire solves the storage problem in a simple and ingenious method. It stores full-sized driver bits in the handle, two per side. A cutout in the liners and grip panels serves as the home to a small, spring-loaded, bit holder on each side. Each bit holder holds two bits between three “fingers” which incorporate the hexagonal shape of the bit shanks themselves. The Spring loaded holders snap back into storage position, which does not allow a full size bit to fall out of the holder due to the limits of the aforementioned cutouts in the liner and grip panels. The Select Fire comes pre-loaded with #5 and #7 straight-style bits, and PH1 and PH2 Philip head bits. However, the true benefit of the use of full-sized bits is that the end-user can replace them with anything which is more commonly used such as red #2 Robertson or such. 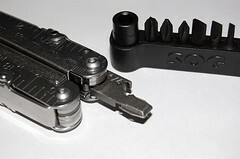 These are the primary and secondary tool components of the Select Fire multi-tool. A large dedicated blade and a dedicated bit driver. The design does incorporate a couple tertiary design features which, in the author’s opinion, are more akin to small design quirks to add to tool count. These are a small ruler on the bit driver arm, and the bottle opener which is incorporated into the recess for the bit driver and requires the driver be extended before usage in both cases. 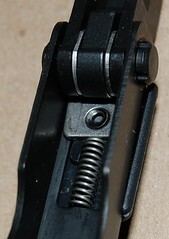 The Select Fire has a reversible pocket clip which allows it to be worn in the tip-down position. Considering the overall closed size of 108.0mm (4-1/4″) and mass of only 152 grams (4.8oz), the Select Fire is a very easy addition as an EDC for anyone who prefers this style of multi-tool. Blade focus versus plier focus. Overall it is well made and, as per most Kershaw products, has a good design and quality for the price. The ONLY detraction the author has is the slight chance that the bit holder springs may protrude just enough to snag on finer materials, but the Select Fire isn’t meant for dressy occasions, so that sort of event may never occur. 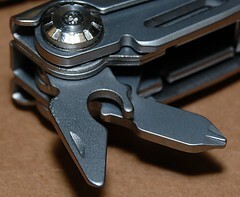 As we have seen in previous reviews, SOG makes a very substantial multi-tool in the form of the Power Lock. They are also one of the few multi-tool manufacturer’s that TPF has seen which offered individual components for their multi-tool. That means that the end-user can truly customize their SOG Multi-tool to whatever is most appropriate for the user’s application. These components are normally classed as replacement parts despite some components have never had an associated product line. One of the biggest surprises to TPF was the availability of the “Robertson Drive” tool arm does not come standard in any catalogue model. Unfortunately, as those items are individually ordered as parts only, TPF decided to do a quick review on an accessory package which is commercially available from SOG. The Hex Bit Accessory Kit (HBA Kit) is a selection of 1/4″ hex screwdriver bits and a driving socket (1/4″ Square) all contained is a single plastic moulding for ease of storage and access. Designed specifically for use with SOG Multi-tools which have the 1/4″ driver included in their repertoire of tool arms, the HBA Kit’s driver socket snaps securely onto the multi-tool driver and contains a magnet to ensure positive retention of any inserted bits. Designed for use with SOG's 1/4" driver, or was it the other way around? There are a total of twelve (12) driver bits included in the kit and that encompasses four of the more common styles of driver, or at least common to our neighbours to the south. There are three Philips bits (#1, #2, & #3), four Torx bits (T20, T10, T8, & T6), two hex bits (2mm & 1.5mm), and the ever common trio of standard flat driver bits (1/8″, 3/16″, & 9/32″). All component bits are the typical 25mm (1″) long bits similar to those found in most screwdriver kits. The HBA Kit, when coupled with a multi-tool such as SOG’s Powerlock, gives a much broader range of available tasks and a more dedicated platform for doing more precise assembly/repair work. The small black plastic bit holder is small and compact and linear in nature. All 12 bits and the adaptor driver are held in place by friction and driver bits are grouped in pairs which makes insertion and withdrawal easy. 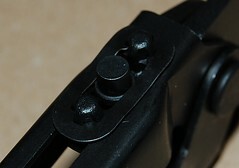 The high impact plastic also allows for the tool holder to be utilized as a small light-duty pry bar. Included on the end of the holder, opposite to the adapter end, is a lanyard loop-hole. Yet the HBA Kit is more apt to be carried with the multi-tool itself in order to assure instant availability should the need arise. The HBA kit is a compact and can be loaded with different bits which the end-user would prefer, such as a #2 Robertson square bit which is prevalent in Canada. SOG’s Hex Accessory Bit Kit, model HBX-01 as reviewed has an MSRP of $20.00 USD and can be acquired from stores such as Camouflage International Military Surplus & Supplies, located in Vancouver, British Columbia, or direct from SOG themselves. 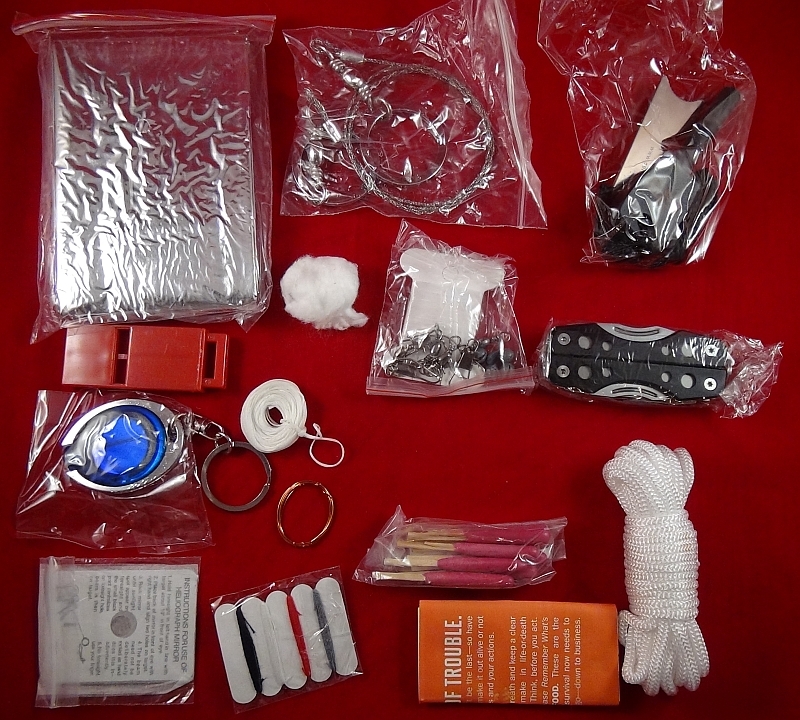 Under which category should the SOG’s Hex Accessory Bit Kit fall under? Tactical, Practical, or Fantastical. Puns and horrible one liner butchery aside, the latest product is another from a well known Brand name and a regular manufacturer to be featured by TPF. Regarding fabrication and design, the Flik is very well engineered. Many thanks to Gerber Legendary Blades and Tools for all their support of TPF Online and in turn the CSSA. In today’s review, TPF takes a look at a proven and still produced multi-tool that was first introduced in 2007. 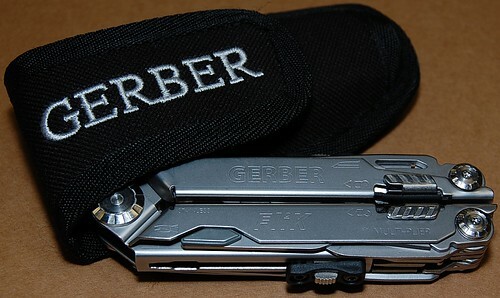 Gerber’s Flik was a variation of the Freehand multi-tool released the year prior and used many of the same features and construction techniques, albeit in a slightly smaller package. At a closed length of 112.0mm (4.41″), the Flik is still quite substantial for most individual’s hands. The nearly all metal construction and usage nearly every iota of available space in the tool itself, translates directly into its 250 gram (8.8oz) frame. The basic handles are identical to each other in basic shape and are constructed from stainless steel, sheet metal whose pattern is laser cut and then formed into a tight, well engineered, package. TPF notes that the while the forming is identical, the handles themselves have visual differences in labelling, which is stamped onto the handle blanks prior to forming. While not the having a great "tool count", the flik has some rare and innovative features. Like nearly every single multi-tool manufactured, the jaws of the Flik are a common combination style of design which include a coarsely toothed oval shaped grasping area preceded by a needle nose on the tip and a side cutter behind it. Previously reviewed by TPF was a similar Gerber Tool, the Compact Sport 400, whose design bears a very similar if superficial design theory. However, the CS400 had one drawback which is alleviated by the Flik’s design. That difference is easily noticed between the Flik and it’s simpler predecessors. The jaws have some addition mechanical locking mechanisms attached to the jaw release buttons. These additional items act as a handle lock; preventing the handles from inadvertently opening when the jaws are retracted. When extended to its full 147.5mm (5.81″) length the Flik’s jaws locking mechanism, ratchets the handles slightly apart, preventing any pinching of the hand when squeezed together. An advanced sliding lock mechanism doubles as a tool arm lifter for centrally located tools. 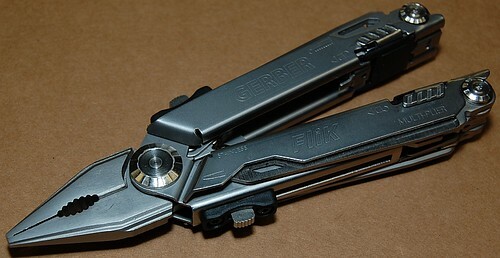 Unlike many multi-tools, the Flik has one very important feature that is underscored by the innovative one handed opening system used by Gerber… All of its additional tools are accessible without opening the handles. Not just some of them but all of them. On the outer edges are the larger tools and blades, and the inner tool arms are extended through use of the lock bar sliders, which partially lift them out of their respective storage positions and allow the user to access them via nail nicks. An interesting construction detail noted by the TPF staff, is that the external tool arm lock mechanisms and the corresponding internal tool arms are mounted with a separate formed sheet metal chassis. This chassis is retained by the tool arm pivot bolt assemblies, but is very well engineered and precise in its forming. While the total number of tools is not extravagant as in many nested tool designs, the tool arms in the Flik are separated by thin washers to prevent clumping when extending tools. Showing the precision forming, the lock chassis and handles are actually very simple in concept. TPF-Online will list the tools in order from the larger external ones, to the internal parts to give readers a listing of what is available on the Flik multi-tool, beginning with all the tools on one handle and then listing all tools located on the opposite handle. Blade #1: Mounted on the outside of the handle is a sheep foot shaped blade, featuring a saber ground edge; measuring 69.9mm (2.75″) in length from the handle. Due to the elongated hole present in the blade’s spine, the knife can be opened one handed with patience and practice. It is as evidenced by the amount of material on the edge side which is not sharpened (also known as the Ricasso) to help when opening one-handed. Sawblade: On the opposite outside edge of this handle is a 76.2mm (3.00″) saw blade which uses triangular profile, opposed teeth with approximately 17 teeth per inch. The tip of the sawblade is angled upwards (without teeth) for a distance of 6.3mm (0.25″) to prevent binding while sawing. The angled tip lifts over the surface being cut and reduces accidental driving of the leading edge into the material being cut. As with the previous blade, an opening on the sawblade is provided for one handed opening. Please note that the saw teeth run the entire length of the blade. Screwdriver #1: A very small and flattened Philips #1 driver. Located centrally in one of the Flik’s handles, this internal tool arm must be initially lifted using the sliding lock mechanism it is mounted upon (as are all internally mounted tool arms). Can Opener: A can opener, self explanatory for nearly everyone. Blade #2: On the opposite handle, the first outer mounted tool is a fully serrated blade which measures the same as the previously mentioned straight blade. However, the tip is blunted and the blade is more rectangular in profile. As with the standard blade, an opening hole is present to allow for one handed opening, as well as the Ricasso. Scissors: The trademarked Fiskar brand of scissors is incorporated into the outer handles of the Flik and as all Fiskar style scissors, operates flawlessly with a positive opening and closing due to the mounting design of the spring arm. While able to extend the scissors with a single hand, it takes some skill to fully manipulate the scissors into the proper cutting configuration. Screwdriver #2: A 2.5mm (0.1″) flat tip screwdriver blade, mounted internally. Screwdriver #3: A 5.0mm (0.2″) flat tip screwdriver which has a bottle opener included. Also mounted internally. Lanyard Loop: The Flik includes a retractable lanyard loop, which is interesting as it is the only part that requires an external tool to extend from the tool itself. Now TPF-Online has commented on the sheath used on the Compact Sport 400, and the Flik’s is identical in construction intent and features. Able to securely hold the Flik, with jaws either retracted or locked into full extension; the velcro flap and vertical belt loop allow for easy and comfortable wearing. As a multi-tool, the Flik has many of the commonly used features required by many for EDC, and the ease of use of the pliers and easily deployed blades and larger cutting tools are a bonus. The only drawback is the smaller size of the secondary tools, which may limit effectiveness and/or functionality of those respective tools. The sheath is designed to carried the Flik collapsed as well as with its jaws fully extended! Overall, TPF finds the Gerber Flik a solid and well designed multi-tool with enough features and a simplified usage that should be appealing to a wide audience. The Flik model reviewed (#22-41054) has an MSRP of $65.00 USD and can be found at various locations and online stores across Canada such as Outdoor Pursuits Canada, located in Black Diamond, Alberta. The Flik can also be obtained with a black oxide finish as well. Also available with a black finish, the Flik is impressive in its design and manufacture. 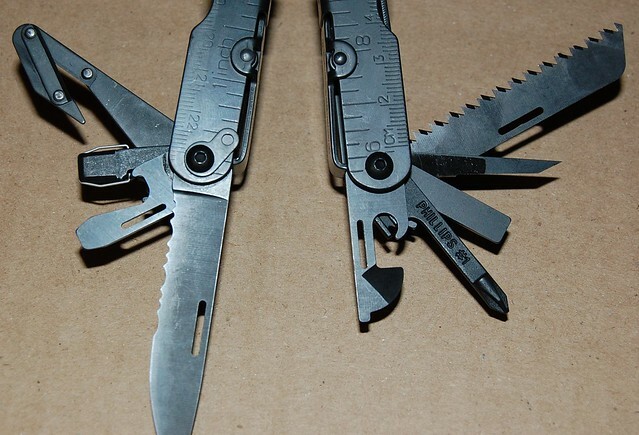 As per the norm at TPF, it is ultimately up to you, the reader, to decide if the Flik multi-tool from Gerber is Tactical, Practical or Fantastical. It seems like TPF has a plethora of blades and multi-tools available for creating reviews about, which is surprisingly correct. Gerber Legendary Blades has been a true supporter of TPF’s endeavours and on behalf of the CSSA, they deserve many accolades for their efforts. As stated in the previous posts, the author of TPF is not a “knife guy” but in the last few months of reviewing so many knives and researching about them, that knowledge level is increasing slowly but surely. The Compact Sport 400, a utilitarian multi-tool? While not wholly familiar with all knife aspects, TPF is familiar with tools, and in this case multi-tools. Gerber Gear’s 400 Compact Sport multi-tool is featured in this review. 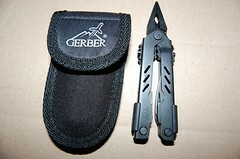 Now the Compact Sport is a slightly smaller, more compact version of the 600 series Basic multi-tool by Gerber. Despite this it still falls into a full-sized category. One of the interesting features of this multi-tool design is the method of which to open the tool with only a single hand. Unlike most multi-tools which have the jaws pivot on studs in the handle ends, the Compact Sport utilizes an interesting design which upon exertion of some centrifugal force, causes the jaws to slide out and lock into position. 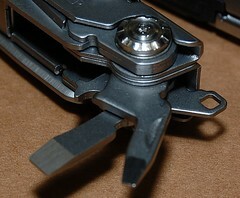 A spring-loaded locking pin is captive via the elongated clip. This retains the jaw assembly in the handles as well as locks the jaws into the extended position. The 400 Compact Sport as reviewed here is the black oxide coated edition, with a brushed stainless steel being the alternate for visual appearance. With an overall extended length of 144.0mm (5.67″), and a collapsed length of 112.0mm (4.41″) the 400CS, is on the smaller side of “full size” multi-tools compared to others which claim the same title. The stainless steel jaws are machined from a forging and are symmetrical in manufacturing (Each jaw is the identical when machined). The handles themselves are identical and are constructed from a single piece of stamped sheet which is then folded and formed into shape and attached at the pivot point with a large rivet. The jaws themselves are also riveted together and are installed in the guide cutouts on the outer side of the handles. Retained by an elongated spring steel clip a captive, spring-loaded buttons on each handle secure the jaws into extended position. TPF will state that there is some side to side play when the jaws are extended, and that is most likely due to the nature of the dual pivots (jaws and handles) and the requirement to float and create a natural tendency to align the pivots for opening and closing of the jaws. The CS400 has multiple tool arms common for many multi-tools which are contained inside the handles and as usual , however one of the features is that each arm is lockable in the fully extended position via a sliding plate lockup mechanism. 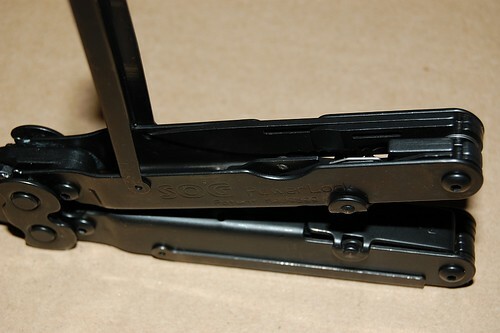 Spring loaded to auto lock an extended tool arm, releasing the lock is accomplished by sliding the plastic tab and disengaging the locking plate. One of the other features rarely seen in many multi-tools is the inclusion of spacers/washers between tool arms which prevent clumping when retrieving tools. Clumping occurs when you are pulling on a single tool arm and multiple arms follow in a “clump”. The spacers/washers is usually omitted in multi-tools which are trying to put as many tool arms into the handles as it is an added cost and space requirement compared to adding another arm or two for additional “features”. 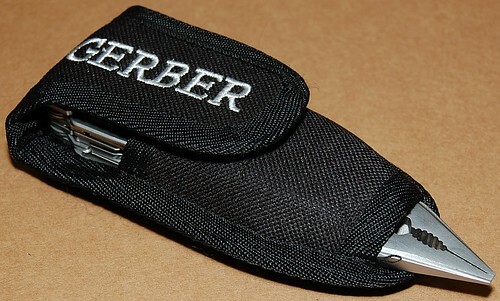 The CS400 is however a value version of the larger tools available from Gerber Gear, and it is apparent that this is a no-frills tool made for abuse. The forged jaws themselves feature a combination pliers layout with a needle nose profile and an incorporated wire cutter. On the inner side (handles), the jaws have a small crimping area to complete the features specific to the jaws of the CS400. TPF will now go over the seven (7) tool arms which are contained in the CS400’s handles. Note that ALL the tool arms are opened via a nail nick which in some cases the author found to be difficult to successfully use. Now this may be due to the CS400 reviewed being brand new and hardly worked in, or perhaps the retaining nut/bolt assembly was tightened to ensure that the tool arms could only be opened by dedicated effort. Now as the handle design has all the rounded edges on the outer portions, the CS400 is very comfortable to use and does not dig in or hurt the hand while applying pressure through the jaws. 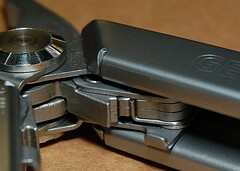 However, like many of this design style of multi-tool, the tool requires opening before one can access any of the tool arms. 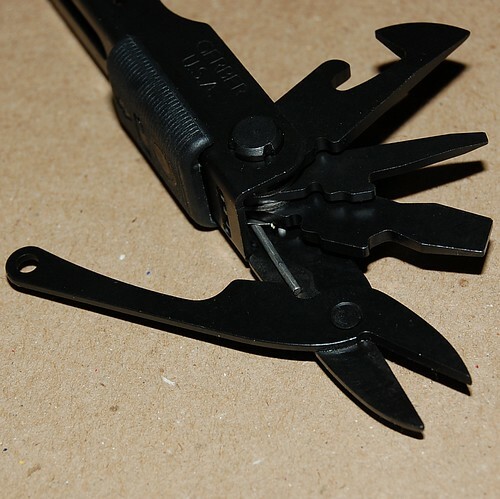 While not ideal, TPF recognizes that the primary purpose of a multi-tool is not to act as a screwdriver or a pair of scissors, but as a plier tool first and foremost. Here at TPF we want out readers to be informed as well, and the CS400 is on the smaller end of the full size multi-tools and the length of the tool arm screwdrivers is limited, but appears to be fully functional. The only drawback in TPF’s opinion is that black oxide finish shows any and all scrapes and nicks far more than a standard version would. 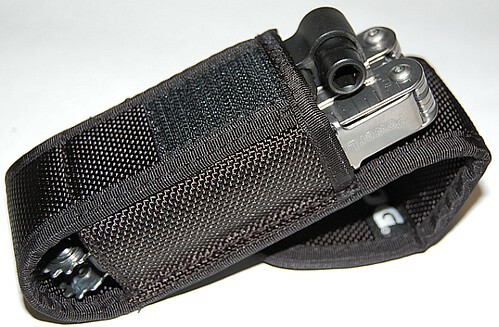 The final component for the CS400 package is the carry sheath. 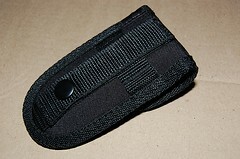 Made of nylon with a standard velcro closure, the CS400 sheath does have some interesting features. The sheath that comes with the black oxide version has a Molle compatible mount which doubles as a standard belt loop method for affixing the pouch and tool to your belt/gear. This may be typical for all versions of the CS-400, but unknown at this time. The most interesting feature of the sheath is that the bottom edge of the sheath is reinforced and open. You can see the jaws slightly protrude through the opening when collapsed, yet this opening allows for the tool to be sheathed when the jaws are locked into extended position. Gerber Gear’s Compact Sport 400 – Black Oxide version; is it Tactical, Practical, or Fantastical? Compound Leverage Multi-tool – It has to be an SOG! Now the author has long carried a multi-tool as part of his EDC for over a decade. 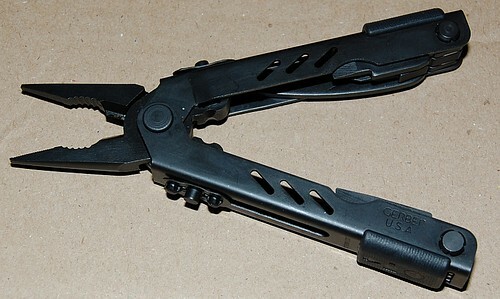 The SOG which has been at my side for so long is still there, but today TPF has the opportunity to review the bigger brother to the SOG Power Pliers. If there is a single thing which stands out with the majority of SOG multi-tools, it is the innovative, geared, jaw assemblies of their multi-tools. With the same hand pressure you will generate twice the wire cutting and gripping power than all other conventional designs. 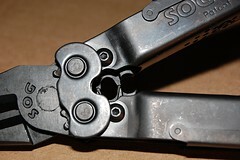 Nearly every model of SOG multi-tool utilizes this technological feature. Now that exact statement cannot be quantifiable by TPF, but the author has used his EDC SOG to perform operations which would have been more difficult if not for the compound leverage system so there is some truth to the claim. 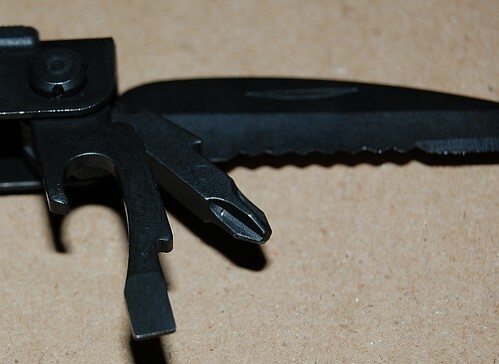 The product reviewed in today’s instalment is SOG’s Power Lock Multi-tool; specifically the EOD version with optional V-Cutter. One may ask why the feature is for an EOD version, and for the unknowing, EOD is an acronym for Explosive Ordinance Disposal. 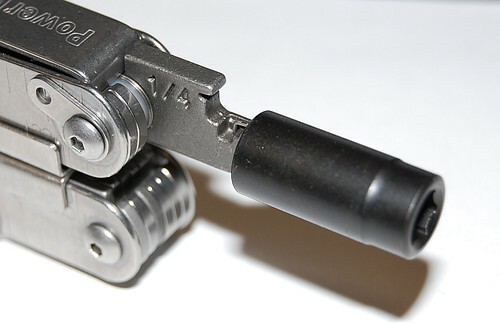 In truth, unless the 2.0 version is ordered, the EOD model designations only differ from the standard models by the use of black oxide finishes. The first thing noticeable is the shear size of the Power Lock multi-tool. Massing in at 272 grams (9.6oz), and having a closed length of 117mm (4.6″) the Power Lock is a massive multi-tool and fills the hand completely without even being open for use. Obvious are the geared teeth of the compound leverage system and when opened for usage, the tool measures 178mm (7.0″) In length. SOG notes that there are a total of 22 tools incorporated into their standard , aka non-2.0, versions of the Power Lock and before TPF starts listing all of these excess tools, TPF will concentrate on the tool’s primary feature. The jaws and the associated compound leverage system. The jaws of the PowerLock are typical of SOG, a stainless steel forging, which is precision machined for accuracy and quality. These pliers incorporate several jaw features. Primarily a set of needle nose pliers, whose fine teeth have seamless meshing, the jaws are stout and designed to be able to withstand much abuse and applied force. Also included in the jaw set are a set of wire cutters and a large aggressively tooth oval opening. It is this combination jaw and the associated compound leverage system which is the mainstay of this multi-tool. The geared pivots incorporated into the handle design, mesh with the corresponding one on the opposite handle, and it is this special design arrangement which allows for the force multiplier to be used when squeezing the handles together. Now TPF could go into the technical details and geometric equations, but unfortunately that does not make for good reading. 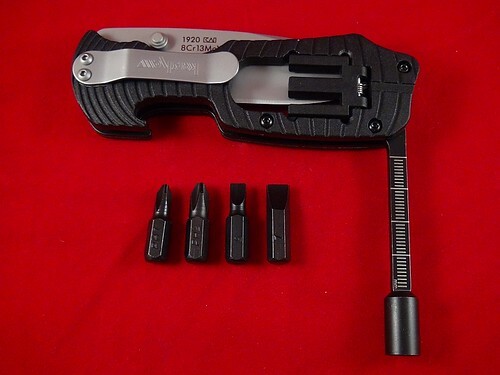 As also marketed by SOG and the variety of multi-tools which utilize the compound leverage arrangement, the PowerLock can be opened and utilized one handed to deploy the combination jaws. The obvious mass of the arms/handles and practice, plus the loosening of the joints/gearing over time, allows for vary fast opening by one hand. Some of the other features of the PowerLock other than the obvious main jaws, are the included crimping spikes/posts located on the inside of the handles when in the deployed position. These two crimping areas allow for fuses to be crimped into blasting caps as well as crimping of wires with connectors. This is present on ALL PowerLock versions as the specialization of a separate jaws assembly would be inefficient from a manufacturing/cost perspective. There are two fairly heavy and rigid flanges which cover the gears and act as pivots for opening and closing the jaws and generating the additional force multipliers to the grasping, cutting and crimping sections of the jaws. Nearly ALL the remaining tools are nested under moving cover plate on each handle. This is the sole obvious drawback of this tool design. You need to deploy the jaws in order to access any of tools located in the handle. The reason for the cover is two fold. It primarily is for reducing the exposed edges and allowing a more comfortable grip while exerting force on the handles. Secondly it protects the additional tools from inadvertent movement from the stored position. Under the panels are the plethora of additional tool arms. As mentioned to access these tools you need to pivot the covers away from the handles. As the covers are literally secured by a small indent, accidental removal of the covers is easily remedied. The listing of tool arms is as follows. V-Belt Cutter: This cutter is used for quick severing of flat belts and small diameter fibre ropes. Very sharp blades are riveted in place on this arm. Scissors (Standard Model): The scissors replace the V-Cutter in standard versions of the PowerLock, The scissors utilize a torsion spring to keep the scissor blades open. 1/4″ Socket Driver: This odd shaped arm is actually a driver for standard 1/4″ sockets. The spring around the perimeter of the arm is used to secure the driven socket to the arm and minimize any fumbling. This arm can be locked into position 90° from the handle. Bottle Opener: One of the most common “tools” on all encompassing multi-tools. This one has a medium sized flat blade screwdriver head on the tip of it. Blade: This 190mm (3.5″) partially serrated blade has a drop point and variation of a chisel grind which has the blade’s back side featuring a concave profile similar to that of a hollow grind. Can Opener: The obligatory can opener to go with the aforementioned bottle opener. Also incorporates a small flat screwdriver tip. Philips: A true size #1 Philips screwdriver head. Comes with a small wire stripper feature built into the nail nick for opening the blade. Flat Screwdriver: The large flat head screwdriver. Awl: A chisel designed and very pointy awl/punch. Saw Blade: This double toothed saw blade is very aggressive in design. File (Not visible): The three sided file which include single and crosscut files on opposite flat sides and a coarse file on a single edge. In addition the file tip acts as a large flat screwdriver. With all the tool arms and jaw features, SOG decided to add in another couple of items that might be useful, which includes imperial and metric rulers and a lanyard eyelet. SOG Specialty Knives and Tools also has the ability for consumers to order replacement blades and tool arms for the nested components as well as some more specialized non-standard components. The one which caught the attention of TPF and may spark interest in the Canadian market is that of the Robertson screwdriver. The final component of the entire package is the nylon case. With a Velcro backed flap to secure the tool into place in the pouch, the universal clip on the back will hold the pouch in a vertical position on belts up to 38mm (1.5″) wide. Simple and effective and with easy access to the tool. The non-EOD version have an option to have a leather pouch which has a positive retaining snap button but forgoes the universal belt clip to a more traditional belt loop style of attachment. A heavy and solid multi-tool with an impressive number of features and attachments, the PowerLock as reviewed (model B63) has an MSRP of $124.25USD, and is available at many retailers and online stores throughout Canada. SOG Specialty Knives and Tools, PowerLock – EOD version with V-Cutter with nylon pouch; is it Tactical, Practical, or Fantastical?